This ISA300Ti amplifier includes a selectable high-pass filters to protect speakers and prevent speaker transformer saturation with minimal effect on program material. The ISA Series provide additional protection circuitry including DC, infrasonic, thermal overload, RF and short circuit protection. Selectable high-pass filters are included to protect speakers and prevent speaker transformer saturation with minimal effect on program material. 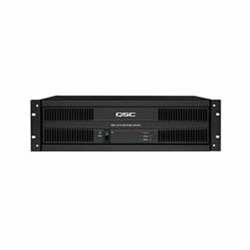 Versatile loading options and a comprehensive feature set make the ISA Series a rugged, cost-effective power solution for any permanently installed sound system. Rear panel gain controls for tamper resistant operation with 2 dB detents for quick and repeatable settings. XLR and detachable Euro style input connectors. DataPort V2 for use with DPV2-compatible signal processing accessories XC-3, SF-3, LF-3 and DSP-3DSP-4 with external power supply. Independent defeatable clip limiters for reduced distortion. Front panel indicators include power, signal, and clip.